Heat oven to 375°F. In large bowl, beat 1 cup granulated sugar, the brown sugar, peanut butter, butter and eggs with electric mixer on medium speed, or mix with spoon. Stir in flour, baking soda and baking powder. Shape dough into 1-inch balls; roll in additional granulated sugar. Place about 2 inches apart on ungreased cookie sheet. Bake 8 to 10 minutes or until edges are light brown. Immediately press 1 chocolate candy in center of each cookie. Remove from cookie sheet to wire rack. Cookie dough can be covered and refrigerated for up to 24 hours before baking. If it's too firm, let stand at room temperature for 30 minutes. Cookie sheets should be at least 2 inches smaller than the inside of your oven to allow the heat to circulate around the cookie sheets. Make things special! If you’re the host of an exchange, invest in some fun packaging for your beautiful baked goods. Browse the aisles of a craft supply place for small lidded boxes, tins, food-safe tissue, and fun ribbons or baker’s twine. Set up a wrapping station so guests can create gifts for family and friends, making the most of the variety of cookies at hand. 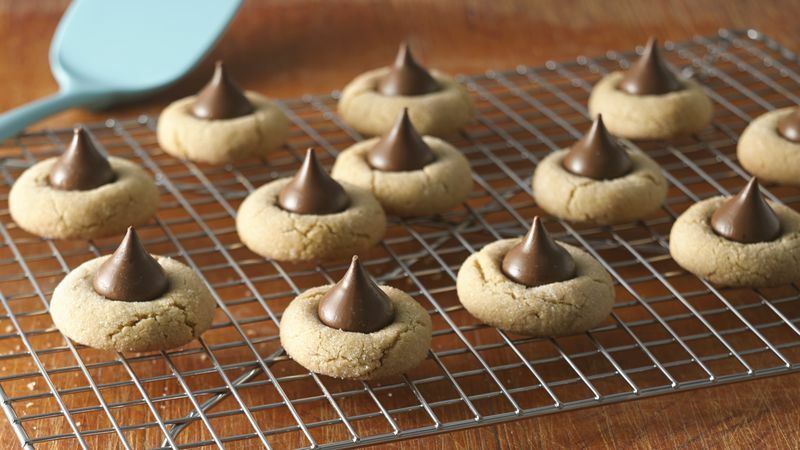 Chocolate-Peanut Butter Blossoms: Increase chocolate candies to 8 1/2 dozen. Melt 1 1/3 cups semisweet chocolate chips; beat in with eggs. After shaping dough into balls, roll in chocolate decorating decors (you’ll need four 1.75-ounce bottles). Bake 8 to 10 minutes or until edges are firm. Makes 8 1/2 dozen cookies. While even a classically plain peanut butter cookie can be a perfect snack or dessert, there are so many ways to up your cookie-baking game by adding silky sweet chocolate morsels to the top of still-warm dough to make peanut blossom cookies. It’s easy to bake up all sorts of delicious versions of peanut butter cookies. This peanut blossom cookie recipe is a perennial favorite, not just at the holidays, but all year long. When it comes you decorating, you can consider some fun variations like rolling the peanut blossom cookie balls in chocolate sprinkles. Or roll them in multi-colored sprinkles for a batch of “unicorn blossoms” that are uniquely your own. Check out Betty’s guide to making the best-ever peanut butter cookies. You’ll find tips for those who like them extra soft and some pointers for those who prefer them on the crisp side. There are gluten free baking options, too. The HERSHEY'S® KISSES® trademark and trade dress and the Conical figure and plume device are used under license.